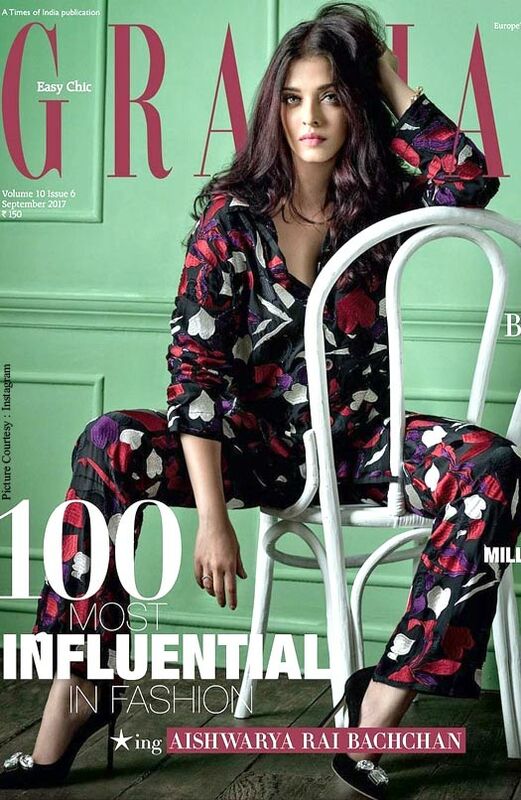 Aishwarya Rai Bachchan looks drop-dead gorgeous on the cover of Grazia India’s latest issue, in which she leads the list of 100 most influential in fashion. The actress is said to be the hottest mommy in town. She struck a pose on a white chair against a green backdrop. The timeless beauty is the face of the popular magazine’s September cover and is a perfect combination of classy, sultry and ‘don’t mess with me’ in black printed PJs by Sanchita. Balancing the red, white and purple leaf and hearts prints on the outfit, she was co-styled by Pasham Alwani, who teamed the set with a pair of black, pointy heels from Jimmy Choo for that classic oomph, and accessorised the ensemble with trinkets from Isharya, and crystals from Swarovski. Bachchan’s hair and makeup were done by the dynamic and sought after Daniel Bauer and Florian Hurel, respectively. Grazia’s issue will talk about Aishwarya Rai Bachchan as the “myth, legend, mother, actor, star, wife, girl-next-door and red carpet queen.” Aishwarya looks phenomenal effortlessly and as we all know she’s a hand-on mother to her five-year-old daughter Aaradhya and of course, her red carpet appearances are always much awaited – example Cannes Film Festival. On the work front, Aishwarya will be next seen with Anil Kapoor in musical comedy Fanney Khan. Anil Kapoor and Aishwarya Rai Bachchan are finally sharing the screen space after 17 years with Fanney Khan. The film is being directed by debutant Atul Manjrekar and produced by Rakeysh Omprakash Mehra and KriArj Entertainment and T-Series. In the film, both Anil Kapoor and Aishwarya Rai Bachchan will be seen playing the role of singers. The film is the official remake of the Oscar nominated Dutch 2000 film ‘Everybody’s Famous!’ directed by Dominique Deruddere.The film also stars Rajkummar Rao opposite Aishwarya Rai Bachchan and is slated to release next year in April. The post Aishwarya Rai Bachchan Owns The Cover Of Grazia appeared first on Koimoi. Ranbir Kapoor & Aishwarya Rai Team Up For The Hottest Filmfare Cover Ever!